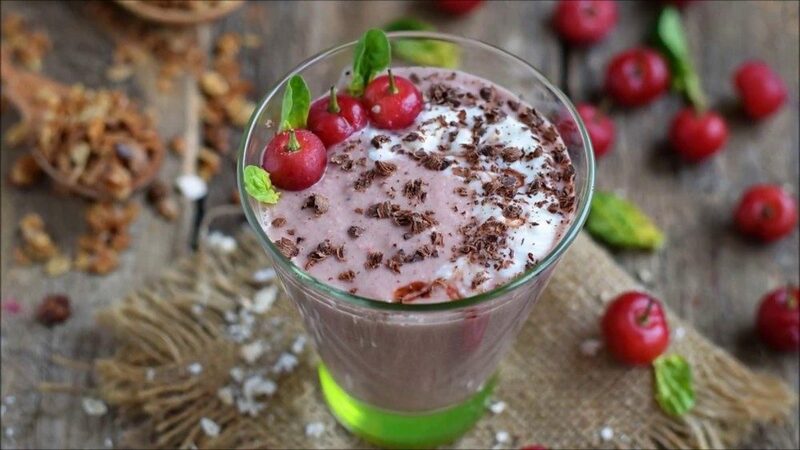 Put the cherries, the banana, cacao powder and granola into the blender jar and add 1/2 cup of almond milk. Chop the chocolate bar into smaller chunks and add to other ingredients. Finally add the almond nuts into the blender jar. You can use the whole almonds if you don't mind small nut pieces in your smoothie. If you want to achieve a perfect smooth texture, grind the almonds before adding them to other ingredients. Run the food processor or coffee grinder until the almonds are ground to a coarse meal or fine flour, depending on your preference. Pour the smoothie into glasses. Sprinkle with dark chocolate and top up with a couple of cherries.